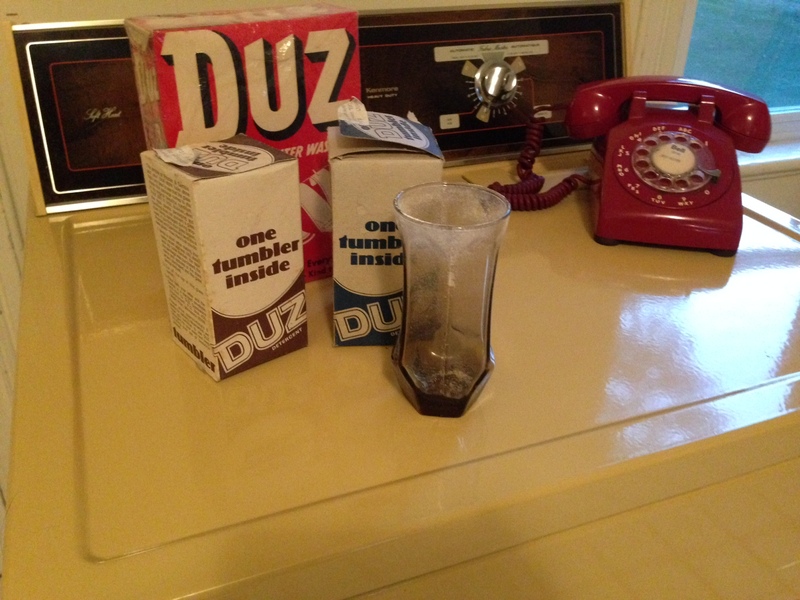 I am pretty proud of this collection: vintage box of Duz detergent; vintage red dial phone (still fully operational); Harvest Gold clothes dryer (also operational, though probably not very energy-efficient); and – the most recent addition – two tumblers (in their original boxes, and still coated with a thin later of detergent dust) that once upon a time, probably a half-century ago, were “free gifts” inside Duz boxes. Would you like to know what gets you page views if you write a blog? I’ll tell you what gets you page views. It is a post headlined “When towels came in detergent boxes,” that’s what. Very rarely does a day go by without at least one person, somewhere in this wide world of ours, paying a visit to Meanwhile, at the Manse because that person had entered into Google the search terms “towels in detergent box” or “Duz detergent towels,” or “things that came in Duz boxes,” or some variation. Who knew that so many people would be interested in reading about the days when towels – and, more to the point for tonight’s post, other good stuff, like drinking glasses – came as a “free gift” inside boxes of laundry detergent? I wrote the post headlined “When towels came in detergent boxes” more than a year and a half ago. It was a little paean to those simpler days when things like a free towel made consumers (fancy name for “housewives”) more likely to buy a certain kind of laundry detergent. And when the bathroom of every household you might go into had very familiar hand and/or bath towels – familiar because they, like the towels in the bathroom at your own house, had emerged from a box of detergent. Anyway. In writing that January 2013 post I searched for a vintage TV ad about getting a free towel in the Duz, unfortunately in vain. But what I did find, and link to there, was an ad about free drinking glasses you could get in Duz. So given that, and also given how popular that year-and-a-half-old post continues to be, perhaps you will be able to imagine my delight when, this past summer, I came upon some vintage Duz drinking glasses for sale in an antiques emporium. Wow! One of the two boxes had been opened, so that you could pull out the glass and examine it. (It’s brownish and kind of ugly but, endearingly, still bears a thin coating of laundry powder.) The other box was pristine – never opened, in all the years (it would have to be at least 50) since it had been packed into the Duz. They cost $2 (U.S.) each. Of course I had to have them. And now they sit proudly on our almost-as-vintage Harvest Gold clothes dryer here in the kitchen of the Manse. Right in front of a vintage box of Duz that our friend and former colleague Gordon Beck (co-proprietor of a wonderful gallery/emporium in beautiful Brockville, Ont.) generously donated to the Manse’s growing collection of relatively useless but nonetheless interesting midcentury stuff. And right beside our vintage red (it’s the hot line, you know), fully functional rotary-dial phone. The lot of them make me smile every time I look at them. And hey, internet: I’ve just given you another post about when free gifts came in detergent boxes. You’re welcome! This entry was posted in Uncategorized and tagged Brockville, Duz, Harvest Gold by Katherine Sedgwick. Bookmark the permalink. ” … the Manse’s growing collection of relatively useless but nonetheless interesting midcentury stuff.” Too funny, Katherine!! Nothing is useless unless you throw it away! Absolutely true, Dave. Absolutely true. I was purging my glasses when I decided to look them up. Now what do I do? I was going to take them to Goodwill, but who else might want them? Is there really a market for them? Sherry, I expect the market is a bit small. Let’s just say I didn’t pay very much for my vintage Duz glasses at the antiques emporium. In other words, not a lot of other people were clamouring to get them. Crazy, I know! Thank you. I think my twin granddaughters will take them to college, as their parents are buying a house for them to live in. That is a perfect solution if you ask me, Sherry! And as time goes by and those Duz glasses become more scarce, they can only increase in value. Cheers, and all best to your twin granddaughters (how lucky are you?) as they start college! I have 6 Smoked Tumblers and 6 Smoked Gobblets from Duz Detergent . Can you tell me the Value?